The Dutch shipbuilding company Damen has performed in the Yichang shipyard in China the inaugural cutting of metal for a liquefied natural gas (LNG) bunkering ship to be built for the Estonian company Eesti Gaas, reporting LETA/BNS. The ship will start refuelling Eesti Gaas' LNG clients in and around the Gulf of Finland in the second half of next year, Eesti Gaas said in a press release. Kalev Reiljan, member of the management board of Eesti Gaas, said there are only a few similar types of ship worldwide, and this will be the only one in the northern and eastern reaches of the Baltic Sea. "In essence, we are establishing mobile infrastructure for natural gas as a marine transport fuel in the Gulf of Finland," said Reiljan. "With this high-tech joint venture, Eesti Gaas and Tallink will ascend to having the title of LNG companies with the most competence and experience in this region. Eesti Gaas has performed over 1,500 port-based LNG truck-to-ship refuellings of the Megastar ferry and now we are moving on toward offshore, more mobile solutions," he said. The first components of Eesti Gaas' future bunkering vessel were cut from 8 millimeter metal sheet and will eventually be the wall separating the ship's engine room and the tank hold. Assembly of the ship’s hull will start in May and be completed at year’s end. According to current plans, the installation of the LNG tanks will begin in November and the ship will be launched next March. After sea trials, the ship will be ready to arrive in Estonia in summer 2020 and will start serving LNG clients on the Baltic in autumn of that year. By creating a mobile LNG-fueling infrastructure, the LNG bunker vessel will serve as an incentive for the construction and use of new LNG-fueled vessels in the Baltic Sea Region and, therefore, has the potential to reduce carbon dioxide emissions annually by more than 66,000 tons. The use of LNG enables to significantly reduce marine CO2, NOx, SOx and particle matter emissions, which are reduced by 30 percent, 85 percent, 99 percent and 100 percent, respectively. The bunker vessel will feature dual-fuel engines, thrusters that facilitate enhanced close-quarters maneuvering and ice class 1A, according to the Finnish-Swedish ice-class regulations. This will allow her to operate all year round, including in the region's challenging ice conditions. The new vessel will be capable of carrying out bunker activities both in ports and outside ports, at designated anchorage points. In combination with the innovative hull design and running on LNG, the vessel's emissions will be significantly lower than those of traditional vessels. The two type-C LNG tanks will contain up to 6,000 cubic meters of LNG at -163 degrees Celsius. The tanks and their piping system will be located partly exposed on the deck, which ensures good access and easy upgrade options as the LNG consumer market develops. 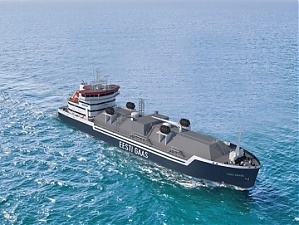 The LNG bunker vessel of Eesti Gaas will measure 99.80 meters in length, 18.60 metes in width, have a deadweight of 3,300 tons and a service speed of 13.40 knots. It is scheduled for delivery in September 2020. The LNG bunker vessel is an important part of the new mobile LNG infrastructure in the Gulf of Finland and the Baltic Sea. This project is co-funded by the EU through the CEF Transport program. Eesti Gaas is the LNG supplier for Tallink Grupp's LNG RoPax vessel Megastar and the future charterer of the new LNG bunker vessel. Damen Shipyards Group operates 36 shipbuilding and repair yards, employing 12,000 people worldwide. Damen has delivered more than 6,500 vessels in more than 100 countries and delivers around 175 vessels annually to customers worldwide. Based on its unique, standardized ship-design concept, Damen is able to guarantee consistent quality.